Communist Party leader Hu Jintao has reiterated in a keynote political report that China will persist in the policy of reform and opening-up, saying the drive is the only way of developing socialism with Chinese characteristics and rejuvenating the nation. The report Hu delivered to the 17th National Congress of the CPC that opened on Monday charts a roadmap for the country's China's development. The Third Plenary Session of the 11th Central Committee of the CPC in 1978 marked the beginning of China's reform and opening-up drive. The plenum introduced a series of important decisions on reform which represented a turning point in the history of the CPC and New China since its founding in 1949. 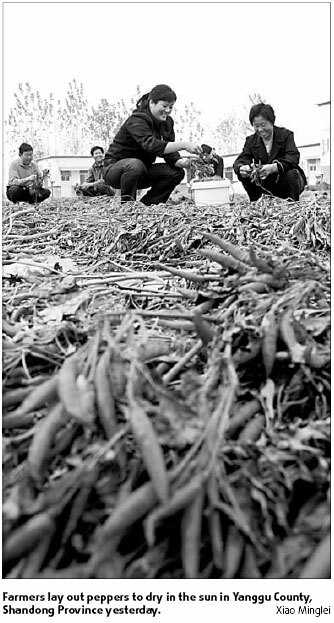 In December 1978, 18 farmers in Xiaogang village, East China's Anhui Province, signed an agreement to divide the people's communally owned farmland into pieces for household contract. The practice was supported by Deng Xiaoping, chief architect of the reform, and recognized by the government, which then initiated the system of contracted responsibilities based on households in rural areas. Xiaogang has since been seen as a pace-setter for the nation's rural reform. China and the United States established diplomatic relations in 1979 and Deng Xiaoping visited the US between January 29 and February 5 the same year, the first visit to the US by a Chinese leader since the People's Republic of China was founded. On July 15, 1979, the CPC Central Committee and the State Council approved reports on special and flexible policies in foreign economic activities submitted by the Guangdong Provincial CPC Committee and the Fujian Provincial CPC Committee, and decided to set up special economic zones in the cities of Shenzhen, Zhuhai, Shantou, and Xiamen. The construction and development of the special economic zones and opening-up zones prompted the creation of a group of regional economic growth centers, vigorously bringing along opening-up around the country. During his tour of South China in 1992, when the country's reform and opening-up drive was at a crucial juncture, Deng Xiaoping pointed out that the goal of socialism is common prosperity. He delivered a series of speeches to define and clarify what was and how to build socialism in respond to doubts that the development of special economic zones was a road to capitalism. The rapid growth of external trade has remarkably enhanced the economy's dependence on the international market. In 1996, China's total foreign trade volume accounted for 35.5 percent of its GDP, thought to be a fairly high level in international terms. It now accounts for nearly 70 percent of GDP. China entered the World Trade Organization in 2001, becoming its 143rd member. "China's negotiations for accession to the multilateral trading system over the past 15 years have been an integral part of the process of reform and opening-up from the beginning to the end," said then Foreign Trade Minister Shi Guangsheng. The government launched reforms of the exchange rate system on July 21, 2005, introducing a managed floating foreign exchange rate system after discontinuing the former forex regime pegged to the US dollar. The overall aim of the exchange rate reform is to build a managed, floating exchange rate mechanism based on market supply and demand and to maintain the yuan's basic stability at a reasonable equilibrium, said the central bank. China opened its financial sector to foreign banks in December 2006. Before that, the country had dropped tariffs, canceled non-tariff measures and opened up its markets in accordance with the pledges it made when joining the WTO. China's reform and opening-up drive was hailed by the World Bank as the largest poverty reduction campaign ever launched in human history, particularly in reducing the numbers of rural dwellers in abject poverty. Statistics show that in 1978, when the reform and opening-up started, China had 250 million extremely poor people living in the countryside, or 30.7 percent of its total rural population. The figure declined to just over 20 million by the end of last year. Between 1978 and 2006, China's gross domestic product grew at an average annual rate of 9.7 percent and the country has developed into the world's fourth-largest economy. The volume of foreign trade has increased from $20.6 billion to $1.76 trillion.